In all seriousness, while being normal lends a sense of comfort, it can also mean you lack creativity and originality. You blend in with the crowd. The bigger the crowd, especially in marketing, the lesser your chance of being noticed. Admittedly, it’s risky to be different. But the rewards are often well worth that risk. Just ask Luiz de Basto, a leading yacht designer. He’s made a career out of it. From the day I first met him nearly 20 years ago, Luiz has looked at the world from a different perspective. He examines what’s being done, and what’s not being done, and why. “Why” to him usually means “why not,” as in “why isn’t anybody doing this?” He then researches the possibilities: the engineering possibilities, the ergonomic possibilities, and the ensuing enjoyment possibilities. Sometimes those possibilities are truly innovative, such as the wheelchair-friendly decks of the superyacht that came to be known as Argyll. Luiz got involved when she was a spec project, eager to challenge the conventional thinking that only so-called able-bodied people could enjoy cruising. 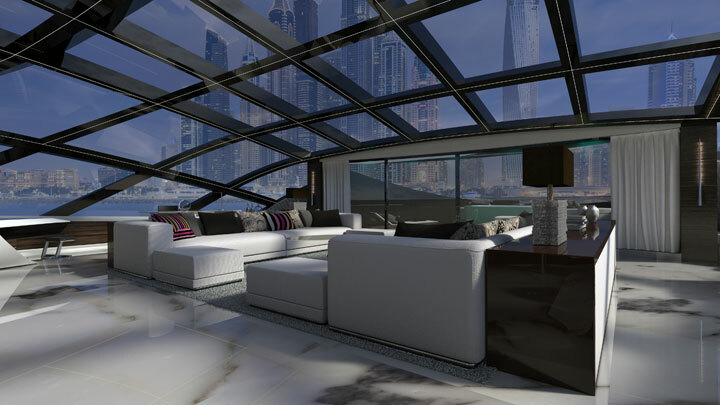 He later created the Top Deck design built by Astondoa, the first (and only) yacht where an upper deck expands usable space with all-around fold-down platforms. Luiz is challenging convention in a bigger, bolder way these days. He designed a concept called Cosmos, pictured here, with Oceanco. More to the point, he pushed Oceanco’s in-house engineers harder than they’ve ever been challenged, by Oceanco’s own acknowledgement. Simultaneously, he’s challenged us in the media, and yacht buyers in general, to think different. How? A significant portion of the superstructure is structural glass, and curved at that. It’s an engineering marvel that was physically impossible just five years ago. It’s never been done in yacht design or construction. But, we’re increasingly surrounded by things like this in our everyday lives. He points to the now-iconic Apple store in New York City, which is being replicated in other cities. Why not, Luiz thought, create an equally open, enjoyable atmosphere aboard a yacht? Doesn’t it make even more sense there, since yacht owners and guests are out in some of the most spectacular places on earth? If you’re conservative by nature, you might accuse Luiz of being a dreamer. Maybe Cosmos won’t ever be built, you’re thinking. Maybe you’re right. Just don’t accuse him of being conventional. This entry was posted in leadership, marketing and tagged Luiz de Basto, Oceanco. Bookmark the permalink.